At the time we were first contacted about the series, we were living outside, as we ended up doing for a year and a half. It wasn’t by choice; Bekah’s immune system is compromised. She couldn’t tolerate mold, mycotoxins or a great many chemicals, i.e. the kinds of things that are found in most houses and buildings. Bekah has been diagnosed with Lyme disease, as verified by a Western blot test and Common Variable Immune Deficiency. In New York, my apartment, as well as her parents’ and friends’ apartments, literally made her sick; right at the end she was living in the park. On the outside, she looks like a healthy, able-bodied person. On the inside, her nerve pain levels are off the charts: she has three blood infections (Babesia, Bartonella and Rickettsia), a staph infection in her nose, brain and heart issues that require more testing, and cognitive impairments. To top it off, while all of these symptoms are undetectable to friends, family, and strangers, we have a large stack of medical records from specialists and several hospitals that document this. In order for Bekah to detox from the mold, we came to the desert and bought a van, stripped down to the bare metal. Three different specialists (Dr. Leo Galland, Dr. Melanie Geisler, and Dr. Mary Ackerley) confirmed that this was a wise choice. Bekah was deathly ill and I was in a sleep-deprived state of hyper vigilance. There was a heatwave building in the desert, her health was getting worse, I was running out of debt options and the specialists seemed baffled. Mold avoidance is a grueling, full-time job. At night, I would wake up in panic mode checking to see if she was still breathing. The isolation was getting to us. We were desperate. It seemed like a beacon of hope when we learned that Netflix wanted to tell Bekah’s story. However, we were concerned when the crew from Docshop, the independent production company making the series, arrived to start filming and presented us with a contract that they expected us to sign it on the spot. Neither of us really understood this contract and wanted to wait a few days so we could have someone look it over. Docshop, on the other hand, wanted it signed that day. They said they couldn’t start filming until we signed. We had the impression that they were ready to pack up and leave and not include Bekah in the film. 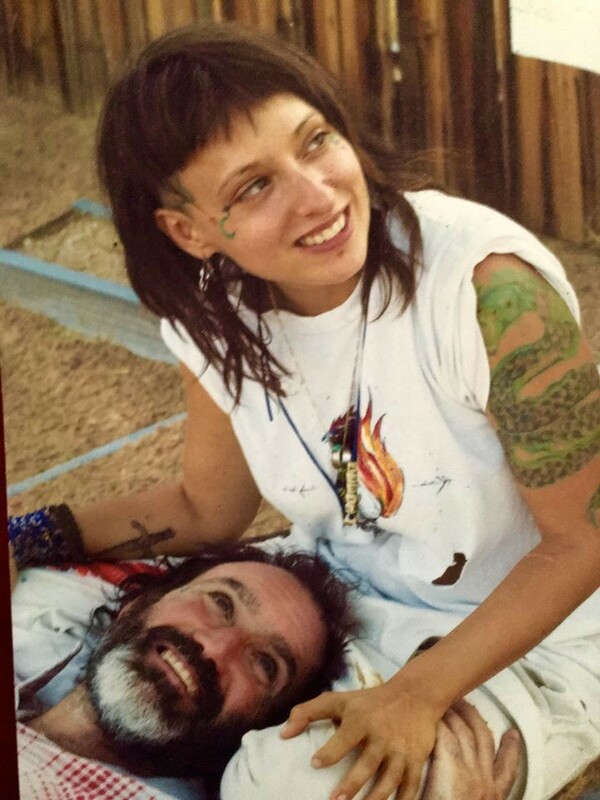 At the time, we didn’t realize how badly they wanted our story: two artists from New York City up in the Mojave Desert with face tatts and a painted van; Bekah, a chronically ill musician, poet, painter and tattoo artist, and me, a sculptor and streetwise Buddhist chaplain intern who had just received a full-ride to Harvard. The first director we worked with was very pushy and had no apparent knowledge of Lyme disease, toxic mold or MCS. He immediately asked us for access to our the most intimate activities; he practically begged us to cry at opportune moments; he wanted to film us while we were bathing behind our favorite boulder, and so on. We constantly had to set him straight. When Bekah decided she couldn’t work with him any longer, Docshop quickly replaced him with Ashley. She presented herself as aware, professional and respectful. When we first met Peter, the executive producer of Afflicted, I took him aside and locked eyes with him — I asked him: Is this going to be the type of thing where you pit people with chronic illnesses against doctors who are skeptical? That’s a tired method that we have no interest in perpetuating. Peter, eye-to-eye, said: No, it won’t be like that; it’s not Reality TV. He went on to say that Bekah would be able to tell her story, it would be great for her fundraising, and that they were working to get her some free treatments. Throughout the filming, both Ashley and the field producer, Stephanie, assured us that they had Bekah’s best interests at heart. They called to check in and give us updates on potential treatments that would be free of charge. I believe now that these free treatments were at least partly used to motivate and manipulate her. We were fully aware that the final film would have edits that we wouldn’t like, and that we might get portrayed as the weird artist couple that live in a van, and we were OK with that. After all, we were the weird artist couple that lived in a van. With that in mind, we were transparent: we gave them everything, we opened up our lives, we trusted them. Filming was grueling. At the end of each day, Bekah would be feeling even more worn out and sick than usual. She showed up for everything like a true warrior. She kept going because she believed they would get her story out to the public and that it would benefit other people who are suffering. After my first viewing of Afflicted, I was excited that the series was out, and I still held onto the notion that it would create a dialogue around invisible illnesses. That lasted about a day as it sank in the degree to which they had hacked apart our scenes and pieced them back together to fit their narrative. Bekah and I were totally devastated; we felt betrayed and defeated, misled, lied to, manipulated, and completely misrepresented. The editing was straight-up unethical and damaging, not to mention exhibiting downright ignorance of the illnesses. They came to us with dissemblance, infected Bekah with their contaminated clothes and equipment, worked her like one of the crew, then took her story and mangled it. They left with everything they wanted, and us totally depleted. And they didn’t stop there. Take, for example, ozone therapy, one of the perks dangled in front of Bekah’s nose like a carrot. She’d had good results from ozone in the past and was excited to try this purported new variation. What you see in the film, though, is a failed attempt at a treatment that turns into an illustration of the filmmakers’ preconceived idea that such remedies are just chimeras. In fact, the procedure didn’t work because Bekah was too dehydrated for them to draw blood. She had told Docshop’s doctor that she needed saline for this very purpose, but was ignored. We don’t see that part though. What we learn in the film is that ozone is just another failed cure, when the reality is that she didn’t receive it because they wouldn’t listen to her. Since Afflicted came out, we have been getting emails from people who are suffering from mold toxicity and are under the impression ozone therapy did not help Bekah. It’s not true, and is an example of how this film does a disservice to the chronically ill community. Another instance of the attempted exploitation of Bekah’s dire circumstances was Docshop’s offer of stem cell therapy. They had made a deal with a company called Infusio to give her this $25,000 experimental treatment for free. Bekah thought she had hit the jackpot, and perhaps so did Infusio. We decided to get a second and third opinion though, and spoke with top Lyme and mold specialists Dr. Neil Nathan and Dr. Mary Ackerley, who are familiar with Bekah’s case. They both said it could be dangerous for her to proceed owing to the specifics of mold as it relates to late stage Lyme. Docshop wasn’t happy about this and continued to pressure Bekah to take the treatment, ignoring her wishes and the advice of her doctors. They claimed that Infusio was certain that it was safe. As it comes off in the film, however, we see Bekah casually turning down a chance at salvation with no explanation of why she would do that. One of Docshop’s agendas seems to have been to show that the symptoms suffered by the chronically ill subjects of the film are psychosomatic. Of course, mental issues came up in their interviews with Bekah. For example, she talked to them about how a person can have cancer and also be bi-polar, just as a person can have Lyme or MCS along with a psychiatric condition. We don’t see that. What we see is Bekah saying that sometimes she feels like just bleeding out in the desert. Thus the complex issue of mental health vis-à-vis chronic illness is reduced to a stark image of someone beyond the bounds of rationality. Her parents were interviewed at great lengths too, discussing all aspects of her situation. All we see of them here are some clips about Bekah being in a psych ward when she was an adolescent. Afflicted claims to be a documentary. We would therefore have reason to expect some examination of facts — information that is not speculative. Actually, the film left out some very important evidence that would legitimize Bekah’s case but which might contradict Docshop’s narrative, such as diagnoses and medical records. They also chose to omit many interviews with doctors that would have supported the stories told by the subjects of the film but not work so well with the apparent agenda Docshop was pursuing. Jesse Bercowetz is an award-winning artist whose work has been exhibited in galleries and museums in the U.S., Europe and Asia. He is a graduate of the School of the Art Institute of Chicago, and a MacDowell Colony Fellow. His work has been covered in The New York Times and Art Forum. He is currently a master’s candidate at Harvard Divinity School. Bercowetz is still living in his van in the Mohave desert. Bekah Fly is an artist, poet, musician and tattoo artist from New York City. She has performed poetry and music across the country and in NYC at Joe’s Pub, the Nuyorican Poets Cafe, Museo del Barrio, and has had her work published in Saul William’s “Literary Mixtape”, “Spoon River”, and “The Brooklyn Rail”. She has been battling severe auto immune illness for the past decade.